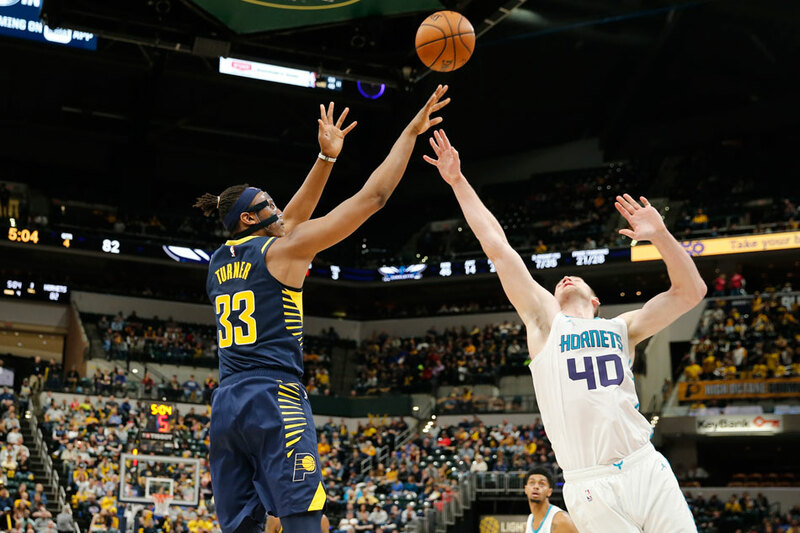 Myles Turner led a balanced attack with 18 points and eight rebounds, and the Indiana Pacers won their sixth straight with a 99-90 victory over the visiting Charlotte Hornets on Monday night. The Pacers raced to a 20-point lead in the second quarter, weathered a Charlotte comeback that got as close as one late in the third quarter, and then pushed the lead back to as many as 14 in the fourth quarter. The Pacers shot 51.4 percent from the field and more importantly forced the Hornets into 32.2 percent from the field. The Hornets were 7 of 40 (17.5 percent) from 3-point range. The Pacers' run is the longest active streak for any team in the NBA. The Pacers lost four straight after All-Star Victor Oladipo went down with a ruptured quad on Jan. 23, but they have not lost since. Wesley Matthews started for the Pacers after being signed on Sunday, and he finished with eight points in 30 minutes including two key 3-pointers in the last four minutes of the game. Kemba Walker scored 34 points to lead the Hornets. Walker has scored 30 or more in five straight games, which ties a franchise record held by Glen Rice. The Hornets also got 21 points from Jeremy Lamb and 18 from Cody Zeller. Their one bright spot came on the glass, where they outrebounded the Pacers 51-39, including a 21-5 edge in offensive rebounds. The Hornets were without two point guards, Tony Parker (lower back strain) and Devonte Graham (illness). That allowed Shelvin Mack an opportunity after he was claimed off waivers on Sunday. Mack went 0-of-2 both from the field and the free throw line as he went scoreless in 12 minutes. The Pacers led 32-19 after one quarter and then scored the first seven points of the second quarter to push the lead to 39-19. Charlotte eventually chipped the lead down to 54-38 at halftime. The Hornets then roared back in the third, getting as close as 72-71 before the Pacers pulled back to a 77-71 lead going into the fourth quarter. This was the third and final meeting in the regular season between the teams, with the Pacers winning 2 of 3. The Pacers will host Milwaukee on Wednesday. The Hornets will close out a four-game road trip on Thursday at Orlando.